If an applicant contacts you and says that their recommendation has gone unanswered, you can advise them to resend their recommendation request. 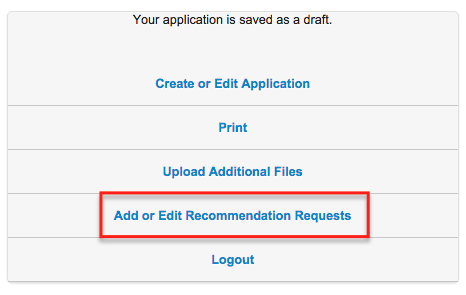 The applicant should be advised to log back into his/her application and access the Add or Edit Recommendation Requests button from the main menu. Before resending a request, the applicant should make sure he/she has put the correct email address for the recommender. 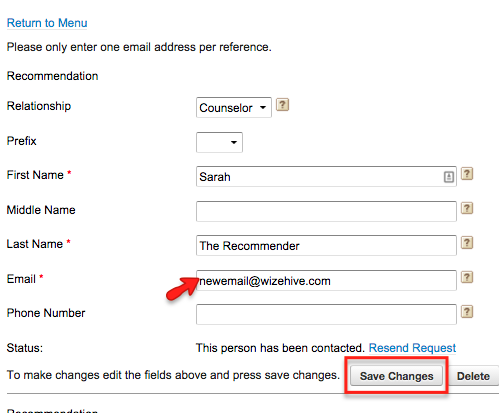 If the email address is incorrect, the applicant can change it by simply editing the text box and clicking Save Changes. It is possible that the applicant entered the recommender's information, saved it, but did not send the request. If the applicant did send the request, the Status will say "This person has been contacted." If the applicant entered data but did not send, the Status will say "Not contacted." 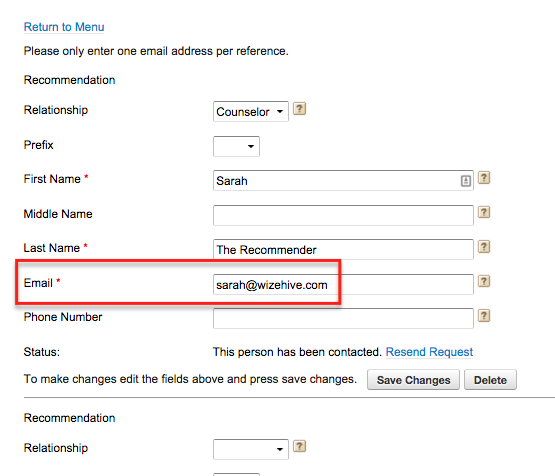 The applicant can click Send Request in order to contact the recommender. If the email address has been changed, or if the recommender has not yet responded, the applicant can resend the request by clicking Resend Request in the Status section. They will have the opportunity to add a new personal message before sending the request.